NEW YORK, Dec 13, 2013/ — Montreal-based denim label Buffalo David Bitton collaborated with renowned stylist Kate Young to design and re-imagine a denim inspired holiday. This collaboration is the second initiative of Buffalo David Bitton’s “Blank Check Series,” a program which supports self-expression and the arts by partnering with cultural innovators. 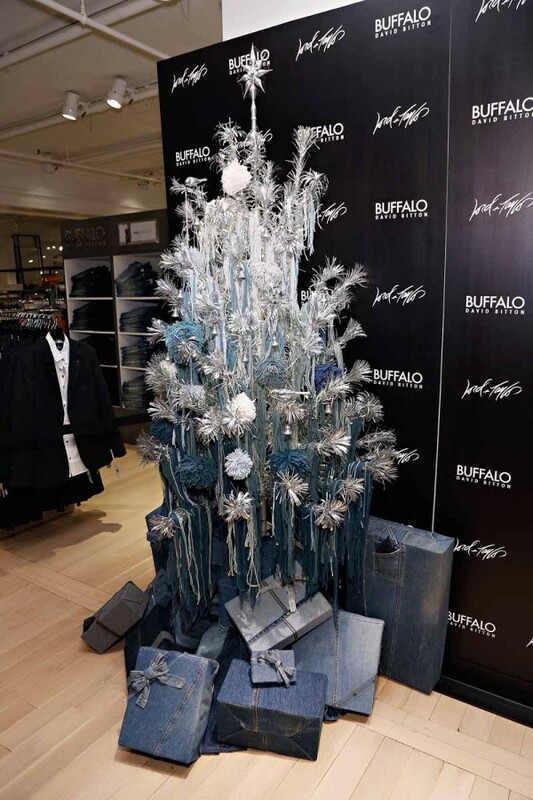 Unveiled at Lord & Taylor yesterday, the Buffalo David Bitton Christmas tree includes a twist on the classic holiday colors, as the stylist was inspired by indigo, white, silver and black. The installation included a thin silver metal tree, draped in hand dyed wool and adorned with handmade bows from the seams of Buffalo jeans. In addition, the tree is adorned with denim-wrapped presents underneath. Kate Young’s installation follows Macklemore & Ryan Lewis’s five-part docuseries of the revolutionary duo’s first arena tour, which launched the “Blank Check Series” project in October.